In April, 2004, in the last week of her life, my former colleague Julie Greene participated, with my sister Inbal and with me, at one of our intensive residential retreats. We all listened for those few moments when she would wake up and speak to us from wherever she was. More than once, she repeated this one sentence which I still carry: “There is no reason to wait even one minute longer.”I know very well about waiting, because it’s one of my coping mechanisms I acquired as a child. I learned to endure hardships by knowing they will end, and counting the minutes, or days, or even years at times. I learned to survive having no capacity to change circumstances, and in the process lost some of my sense of power to create change. I still, to this day, continue to wait, though less and less, in all aspects of my life. For a less stressful time in which I can finally shift an inner pattern, or the compatible people with whom I can connect, or the circumstances that will bring more ease into my life, or the perfect opportunity for making a difference. What would it mean to shift that habit completely and bring the future into the present? When I remember Julie’s words and leave behind my habit of waiting, I sometimes experience a kind of glee, like a child that just discovered a new way to climb on the counter and get the goodies that were previously out of reach. This is a subversive act, because it means embracing my power, releasing the shackles of helplessness, becoming an agent in my life and beyond. It’s a way to move to another story, of living as if the future, previously a dream, is truly here, now. There are very personal, almost private, moments of new choices in this new possibility. Sometimes it takes the form of choosing to follow the radical practice recently given to me, the practice of wasting time, for fifteen minutes a day. When so much is at stake in the world, when the organization I co-founded is struggling financially, and when my beloved sister is continuing to struggle with ovarian cancer, it’s no small feat to waste time. I rarely manage, maybe once a month, so far. Because I wait to be done, which never happens, and then the day is over and I “forgot” again. Sometimes living the way I want the future to be means taking enormous risks in relationships, such as revealing myself to people who may not appreciate who I am, what I do, how I think, what my feelings and dreams are, instead of waiting for people to first show me that they can receive me. Or the risk of loving and trusting and opening to another even when they are so different from me that I experience them as foreign. Or speaking with strangers, often, comfortably, as if we truly are fellow humans instead of waiting until some day when polite disconnection is no longer the norm. Sometimes it means being willing to take material risks. I have committed myself to a maximum wage (about which topic I plan on writing soon), beyond which everything goes to feed the projects about which I am passionate. I am not accumulating any savings, entrusting myself instead to the radical idea that security lies in community and relationships and not in money, knowing full well this may not work out and I may be one day alone and without the resources to care for my well being. I know what I could continue to wait for and won’t any more. For the anxiety to go away that we all have about not having our needs met, because so much of the time that is our common experience in the modern world, especially in childhood. Functioning in a group, any group, with or without leadership, can so easily result in losing all our personal skill, and reverting to separation, mistrust, and judgment.Living the future, now, means recognizing that those of us who’ve had access to transformation, whether through Nonviolent Communication, like me and many who read this blog, or using some other method, are privileged. Choosing not to wait means taking on the joyful responsibility of stewarding the needs of everyone with whom I interact. It means going beyond any notion of fairness to recognize that my training and my skill confer a unique advantage to me in terms of my capacity to work internally with whatever triggers I find and show up for the amazing opportunity almost invariably present of doing the sacred work of creating solutions that address everyone’s needs. Lastly, on the biggest sphere at which I operate, I can stop waiting for the right person with the right connections to the right other people to be open and receptive to my suggestions. The future will not be significantly different from the present if we all act as if change is not possible or only possible after it’s already happened... I can begin, instead and immediately, to consider everything I do to be the possible seed of change beyond my wildest dreams, and use all the tools available to me within my actual sphere of influence. Creating meaningful relationships with the actual people that interact with me I learn that my sphere of influence is almost always larger than I take note of even if it’s smaller than my wishes. If I bring to bear, with support and community from others, my vision and its application to the specific moment in which I find myself, then I continually take steps towards this vision. A different future is then born, again and again, in each of my small and meaningful acts. The plaza is barricaded on all sides, with only employees being allowed to enter. Some restaurants are openly displaying their menus in an empty plaza full of sanitation workers. Who would be buying food when no one can enter, I wonder. Later I see police allowing some people - I imagine only those looking “respectable” - to walk into the plaza to order food out. Something ironic about closing off the entire plaza when one of the reasons for evacuating it was to support local businesses. I ask the policeman how he feels about the whole thing. He shrugs his shoulders and says he’s just doing his job, doesn’t have an opinion. I offer my reflection that it’s tough to be there and do what he does. He says that being a cop is tough, period. On October 18th I participated in the general assembly meeting in OccupyOakland. On October 22nd I posted a piece about that experience, which I named In Search of Dialogue. Even before writing that piece I have been engaging in my mind with the large question of decision-making in this movement. Since I posted this piece, I have received many comments and have read much that others have written, all of which have taken my thinking forward. I remain deeply humble as I reflect on this movement. I believe even more than before that no one at this point can predict what this movement will bring about. With all the humility, I still want to ask the question: how can a movement maintain its focus and vision, include everyone that wants to be heard and create an efficient collaborative decision-making process? Some time ago I talked with one of the core organizers in NYC, a young man who has applied himself seriously to the study of Nonviolent Communication. I was struck by the astonishing challenge of continuing to make decisions on the basis of full consensus with everyone present as the number of people participating kept increasing while more and more of the participants were transient members. As I offered him some tips about facilitation and decision-making to address some of these issues, I noticed that he loved the ideas, and yet didn’t see a way to implement them. This was not due to lack of skill on his part, since I could walk him through the processes easily. Rather, it was because he was deeply concerned that anything that looked like active facilitation would be viewed as taking power and leadership, and would thus run counter to the intense ethos of operating in full shared power and in a leaderless manner. Could there be room for leadership within this leaderless movement? I so loved what Sharif Abdullah wrote about the role of leadership in movements, that I would rather invite you to read his piece than say similar ideas less eloquently. He writes almost daily about the movement, and you can find his writing at http://www.praxis.commonway.org. In his piece on leadership in the Occupy movement, Sharif makes two significant points. One is that the movement doesn’t have all the conditions necessary for thriving without leadership. The other is that leadership takes many forms. People are reacting to a perception of leadership as control, as someone telling them what to do. Sharif is advocating a form of leadership that he calls “emergent” and is based on encouraging and stimulating others along with several other features. I see the facilitation of collaborative decision-making as an active form of leadership that is fully aligned with Sharif’s vision of emergent, catalyst leadership. I so hope that this kind of leadership will be welcomed in the communities spreading around the globe. Is Consensus vs. Majority All There Is? I read a piece today from Michael Albert called Occupy to Self-Manage. He’s been on the road for six weeks, and has talked with people in a number of European countries about their experiences of their occupations. Many of them had been dwindling - although people still show up for specific actions. In response to his questions, people repeatedly shared that the consensus process of the general assemblies was a large component of what interfered with people making the commitment to stay for a long time. I can completely see the appeal of consensus as compared to majority vote. On the face of it, consensus honors power-sharing and is concerned for everyone in a group. This direct sense of everyone’s participation has got to be a key reason why this process was adopted so widely. Despite its appeal, the process has encountered serious obstacles because of the issues that arise around blocking, because it can take such a long time, and because random people that show up can interfere with reaching decisions. As a result, OccupyOakland, for example, has adopted a modified consensus process based on 90% of non-abstaining votes. Although 90% is a very high proportion, that still leaves open the question of what happens to the minority, and especially if the issues that a minority has with a particular decision are significant for it. Is there truly a way to include everyone, or does inclusion by necessity mean losing the possibility of an efficient decision, or reaching one at all? I have been working with groups intensively for the last fifteen years, and have been consciously examining the question of decision-making within groups for at least ten of them. Based on my experience and my reflections, I see a clear path to a process that efficiently generates decisions that people can truly accept, without implicit of explicit coercion, and with care and attention to all that’s important to everyone. I have been teaching this process and people have applied it in many settings. I haven’t yet seen it applied in a group larger than 250 people. I am confident that applying it in the Occupy movement as is, without modifications, would run into some similar problems to a consensus process. Either process, to be fully operational, would require learning how to function in smaller groups and still reach decisions that work for everyone. In a manuscript I recently finished and am now editing I include a vision of a possible world and in it I describe a global governance system based on similar principles that could, with some adjustments, apply to the settings of the occupations. For the moment, I only want to discuss some key insights that by themselves could possibly help in certain situations. Beyond that, I can think of few things that would give me more satisfaction than working with some facilitators to adapt the process to the existing conditions at the various encampments. Most of us have been trained to assume that the only way that someone’s position would shift, if at all, is through a compelling argument. Most activists that I have worked with and coached have been given extensive training in how to speak about their opinions, and see it as their work, in many instances, to convince others who may have different opinions. • We are fully heard for what’s important to us, or what our vision or dream is, that have led us to adopt the position we have. This allows us to relax emotionally and be more open to hearing and more curious about others’ positions. • We come to a place of understanding of what’s important to someone else that is underneath their position, or what their dream is, or what human need is motivating them. Not just intellectual understanding; we actually open our hearts to where someone else is coming from, or are moved by their humanity or the vision they have. • We trust that on the deepest level what this other person most wants is not at odds with what we want. • We accept the premise of finding a solution that works for everyone. • We experience freedom to choose rather than any coercion to adopt a certain position or to shift in some direction towards others. We trust that we are cared about, and so is everyone else. I have had enough experiences of polarized people coming together to know this is entirely possible, even likely, when enough connection has been achieved through dialogue. It is the foundation of the decision-making process I designed. I have a deep and abiding interest in inclusion. I know my own desire to be included, to know that I matter, that what’s important to me counts, that I can have a say and affect an outcome. I also know how important it is to me to include others when I am part of a group and even more so when I lead a group. At the same time I know how exponentially unwieldy discussions can become when the numbers grow. One person speaks, others want to speak, then others want to respond. Meanwhile others sit in amazement as the same points are made over and over again. As Sharif Abdullah said, “Just blurting out whatever you want, whenever you want to, is NOT democracy.” Is there a way out of this nightmare that doesn’t sacrifice the value of inclusion? I have found that one distinction makes all the difference in the world: the difference between including everyone’s voice and including everyone’s needs. If, as people speak, we are able to capture the true needs for which they speak to their satisfaction of being heard, and if we are indeed committed to including all the needs, there is no reason to hear anyone else articulate a position or opinion that stems from the same need. Once the need has been named, only additional needs can be invited to speak. I see this confusion between hearing needs, issues, and concerns, and hearing everyone’s voice as a big impairment to group functioning. Reaching decisions, especially in large groups and under stressful conditions, benefits from focus, clarity, and conciseness. That is not a substitute for each person being fully heard as an individual human being, which I see as an irreducible aspect of becoming more empowered, whole human beings. What’s vitally important in my view is to separate those two, so we can have a context for making decisions, and a separate context for hearing people’s stories, pain, concerns, needs, dreams, and everything else about them. In practical terms, if I stand in line to speak at a decision-making meeting, and what’s truly important to me has been named already, even if in different words and through a different opinion, then I can sit down knowing that my need is already included, especially if I trust that some other context exists for me to be fully heard as a human being. A facilitator can invite people to only speak for issues that hadn’t yet been named. This, to me, is a key to efficient inclusion: we never need to hear the same thing twice, because it’s not about how many people have the same need. If we commit to shared ownership of all the needs, and working on a proposal that addresses all of them, we can let go of more and more voices. • I put a tremendous amount of emphasis on creating shared holding of all the needs that are named - before, during, and after creating a proposal. • I engage people in stretching to be open to including others’ needs. Towards that end I hear everyone’s objections and identify needs in them; and I invite them to the commitment to create an outcome that works for everyone. • I work diligently to identify for everyone what the underlying needs might be. I write them on one sheet of paper, regardless of positions, so that everyone can see and join the commitment. I always name needs in terms of what someone wants to create, what’s important to them, or what is their dream, rather than in terms of positions, what “should” happen, or what is not working. • I support people in evaluating proposals relative to needs that have been named, with the aim of reaching a proposal that can address all the needs. • I guide the process of reaching an actual decision through a series of questions that check people’s willingness at different levels, until a decision is reached that everyone is willing to embrace, even if it’s not their preferred outcome. I never see it as my job to tell a group what decision to make, though I have often participated in crafting proposals based on needs that had been identified. I have heard people raise two key issues in regard to the dilemmas of holding minorities within a consensus process. One is the frustration about there being a small group, sometimes even one person, who can block a decision from happening, a frustration that arises from the desire for efficiency, movement, or trust, among others. Conversely, I have heard grave concerns expressed about people being pressured to go along with a decision even when they are in disagreement because of the fear of judgment of them if they chose to block the decision. In this context I have heard people express the hope that majority voting changes these dynamics, even a sense that minorities are respected when they have the opportunity to vote their dissent without thereby blocking the process. From the vantage point of the process I have created, and especially with the transformative power of dialogue that aims to bring people together, expressing a dissenting view gets depolarized through the finding of shared human needs that everyone subsequently owns. I have both found people willing to express their concerns, as well as others willing to hear them, when a facilitator can maintain a relaxed attitude of trust in the process. In fact, the process of surfacing the concerns, issues, and underlying needs is one of the key building blocks towards a decision that is attentive to more and more needs and is therefore more likely to lead to robust agreements that are kept by everyone, because they know they matter and are part of the whole. This coming weekend, Nov 5-6, I am offering a 2-day training in group facilitation, including an entire day focused on the decision-making process I mention here. I would be honored and moved to have people from any occupation movement attend this training and engage with me about whether and how these insights can be applied in the complex and ever-changing context of these movements. The training is called “No One Left Behind: Facilitating Efficient and Productive Meetings.” I am not thinking this is the only way to go. I am thinking of it as a way to go. May this movement find all the necessary support to move forward towards the vibrant dream of a world that works for all of us. I have not been to OccupyOakland since Saturday. For almost two days, no one was there, as police blockaded the area after destroying the camp early Tuesday morning. As of Wednesday night, occupiers broke through the police blockade and reentered the plaza. Along the way police used so called “non-lethal” weapons, one of which critically injured a young man who has since become a symbol for global solidarity for Oakland. I sat at the computer intending to write an entirely different piece, one that’s been waiting for days now, about leadership and facilitation in the movement. I was simply unable to do so, because my heart is completely consumed with how to hold all that’s happened with love and human understanding. This includes all the people whose actions I find extremely difficult to comprehend. I cannot write about anything else involving this movement I so want to support until I am able to metabolize these events. It is easy for me to extend love and understanding to the occupiers who braved the police and continued to march towards the plaza in an effort to reclaim it. It is easy to extend love to Scott Olsen. I read about him a little. I looked at his face. He’s a young man who chose to ally with the occupiers after serving two tours in Iraq and then joining Veterans for Peace. No challenge for me. I find it inspiring that someone who was in the army can wake up to move towards peace and transformation. It is easy for me to extend love and understanding to the people from Egypt who are organizing a march specifically in solidarity with Oakland. It is easy because I can identify with them, see them as being like me. I can see their care, and I connect with care easily. And it’s not all easy. My attention is drawn to some reports suggest that some of the marchers threw rocks or bottles at the police. How can I extend love and understanding to any who may have participated in such actions? I close my eyes, and I do all I can to imagine that I am the one throwing a bottle at the police. I imagine the rage, the helplessness, the absolute insistence on maintaining my human dignity despite everything, the surge of determination to remain powerful, to make something I believe is right happen. And I try to imagine my arm moving back with a rock in my hand to gain momentum, and then throwing the rock, and the sense of power I get from it, that I am doing something for justice. It’s extremely difficult for me to fully imagine this, an act so counter to my sensibilities, to how I know myself. I am filled with tears as I do it, and am completely connected with the human possibility of this act I would never myself choose. I poke around, read some more, and encounter a comment on the OccupyWallSt site: “If that is true about ‘some protesters throwing rocks and bottles at the police’, it was EXTREMELY STUPID of those protesters and they should be banned from Occupy Oakland for life. Some of them were no doubt ‘AGENTS PROVOCATEURS’ planted by the CIA. Throwing rocks and bottles is EXACTLY what the 1% hope we will do, so as to justify a police crackdown and the imposition of MARTIAL LAW”. I can feel in my body the anguish of being called stupid, and I pull myself away from that anguish to focus on the person who did the calling. I know about the power of nonviolence in the face of repression. I have such deep hope that the Occupy movement will deepen into more nonviolence. And so, despite having just understood in full and embraced in my body the people who possibly threw things at the police, I am totally and easily aligned with this person’s deep concern about this action. And yet a part of me recoils from the idea that they should be banned forever. That’s where the challenge lies for me. Why call them stupid, and why the desire to ban them. So I close my eyes again, and then I find the link. I know of the many times I wish that someone disappeared whose actions I find disruptive of some purpose that’s important to me. Through this, I can imagine being this person. I touch the active passion for this movement to work, to be impeccable in giving the police no excuse, so that the sympathy of the world can be maintained. I am awash with overwhelm. So many more actors and players are involved, not only with Scott Olsen’s injury. I am thinking of the people dealing drugs in some of the encampments. Or the ones whose actions leave women feeling unsafe at night. I know of and have seen people who inhabit different enough realities that their participation in meetings and activities challenges everyone. I branch out and think of the police who attacked the occupiers, and especially those who made the choice to throw one more tear gas grenade at the people who were gathering around Scott Olsen after he had just been injured. Can I ever find room in my heart for all of them? Then there is the Tea Party person who holds the organizers of the Occupy movement responsible for Scott’s injury. And last and by far not least, I think of Oakland Mayor Jean Quan, who issued conflicting messages in response to the actions of the police, including initially commending the chief of police for what she referred to as “a generally peaceful resolution”, and is now facing increasing pressure to resign. There is no blog post that can be long enough to include my efforts to embrace them all. It takes enormous effort to imagine the human emotional logic that would lead all these people to the actions that they have chosen. I find this effort deeply significant, because I want to live in a world where no one is a throw-away person. I want to create a world that works for all of us, not just those who are easy for me to understand and love. I want everyone to have their humanity honored, to have access to resources, to have food, and shelter, and health, and love. I really want everyone’s needs to matter, these are not just words for me. It’s the only way I know, ultimately, to end the millennia-old cycle of violence, hatred, suffering, and separation in which we live. In the meantime, I want to extend love to myself for a moment. It’s so demanding to make room inside me for everyone, so, so challenging. Some years ago, when Rabin was assassinated, I called a friend to work my way through the many reactions I had. I do not have God in my life, haven’t believed in a transcendent being in many decades. Nonetheless, among the many feelings I found, the one that surprised me the most was a moment in which I felt something I can only call compassion for God. I understood, in that moment, that God’s job, in that moment and in all moments, is to love everyone fully and equally, all of creation. And that meant loving the assassin. And I felt compassion for the enormity of what it would take. I am a mere mortal, and it’s taking all I have to even imagine it. In conclusion, I want to be sure I clearly articulate that no amount of love and understanding for everyone is a substitute for action to bring about concrete and material results. The point of this love is to ensure that our actions are free of violence, hatred, and separation. So that we don’t end up where so many revolutions have in the past: recreating the very conditions that the revolution was seeking to change. This means including, ultimately, the 1% in the final outcome just as much as the homeless that are being reached out to in some of the encampments where they have lived for years before the occupations started. Unless we include everyone, some people will eventually become some new 1% and some others will become drug dealers and threats to their fellow humans. I fervently hold on to this love. It’s my insurance policy that success will mean success for all. On my third visit to OccupyOakland, I co-led two workshops hosted by Nichola Torbett, founder of Seminary of the Street. In both of them I collaborated with Nichola and with Kazu Haga, an Oakland-based Kingian Nonviolence trainer. The conversations that emerged in these workshops, along with a recent post by Sharif Abdullah about vision implementation, form the basis of what I am writing below. Although only one of the people who came to either workshop expressed an active disagreement with a commitment to nonviolence, her presence was sufficient to spark a profound conversation about the topic. Throughout the two workshops we kept coming back to a fundamental distinction between the question about whether nonviolence works and whether or not we are committed to nonviolence as a matter of spiritual or other belief system. Part of what was so poignant about the position of this person who wasn’t fully committed to nonviolence was precisely how much in her heart she was committed, and came to shift her perspective primarily based on an analysis that led her to question the effectiveness of nonviolence. The more I read about nonviolence, the more I discover that movements tend to choose nonviolence because of their belief in its strategic value, not necessarily because of a principled disavowal of the use of violence in certain circumstances. It’s a pragmatic choice, not a values-based choice. Full commitment to nonviolence on the basis of values, whether spiritual or secular, means maintaining a nonviolent stance even if it doesn’t seem to work, even if the goals never materialize, even if the movement is crushed by force. This is an extremely challenging position to take. I cannot imagine asking this of anyone whose life has been affected by trauma, severe deprivation, pervasive discrimination, police brutality, poverty, or any other kind of structural ongoing violence. Those are the classic conditions that breed violent uprisings, terrorist activity, or, in less extreme situations, anger or even hatred. The level of internal resources necessary for such a commitment to nonviolence, especially in the face of potential or actual repression, cannot easily be available under such conditions, because those conditions erode the human spirit. If there is any chance that nonviolence will be proclaimed as a strategy, especially in Oakland, especially in response to the police, it rests on being able to show that nonviolence works. Thanks to Erica Chenoweth and Maria J. Stephan, whose work I already quoted last week, we now have information at our disposal that can make this case. Anyone who likes to check things out for themselves can find the information in their book, and much of it summarized in an article. The basic finding is that of 323 violent and nonviolent movements they analyzed between 1900 and 2006, 53% of the nonviolent ones succeeded as compared to only 26% of the violent ones. What’s even more telling is that when the movements were repressed, the nonviolent movements were 6 times more likely to succeed. The primary reasons for the success of any movement, whether violent of nonviolent, is popular support and the ability to undermine the sources of support of the existing regime. No matter how repressive any regime is, coercion alone is never enough to maintain the status quo unless the armed forces remain supportive and the population remains fragmented and disengaged. As the case of Egypt demonstrates, when the population rescinds its implicit willingness to go along with the regime, and when the armed forces shift loyalty, even a very established repressive regime crumbles. If sympathy for the movement and de-legitimation of the regime are essential conditions for success, that provides clear understanding of why nonviolent movements fare better, and especially why their response to repression adds to their relative success. A movement that manages to maintain a nonviolent stance in response to repression is much more likely to achieve both of these conditions. It’s harder for most people to support a regime that cracks down on nonviolent resistors than a regime that appears to be responding to violence initiated by a movement. Here is where common misperceptions of nonviolence are responsible for much of the negative attitudes towards it. As Kazu demonstrated during our workshop, a world of difference exists between non-violence and nonviolence. The former is what so many people associate with the latter: it’s a negation of violence, and it encompasses within it passivity, a non-response to what is happening. Nonviolence, on the other hand, as conceived by Gandhi and Martin Luther King, Jr., is fierce and loving. It is an active force that stands up for truth, justice, and love. Kazu reminded us that being able to accept repression while fighting for a vision of a different world often requires much more courage than fighting back. Because of the astonishing lack of knowledge of the history, principles, and tactics of active nonviolent resistance, many people aren’t even aware of the heroic measures taken by nonviolent activists throughout the last century. The Danes, for example, were able to save almost all the Danish Jews under Nazi Occupation, a feat unheard of in any other country, because they adopted a nonviolent resistance stance towards their occupation instead of passivity or armed resistance. This is where Sharif Abdullah’s contribution to our understanding of nonviolence is so critical. His term - vision implementation - describes a core aspect of the active and revolutionary aspect of nonviolence. Visionary nonviolence goes way beyond acts of protest and paves the road to the future by utilizing creative actions that are, in his words, highly illegal and highly moral. Setting up camps on “occupied” areas where aspects of the vision of a possible world are a daily lived reality is definitely a form of vision implementation. When the workshops were over, I went back to the camp, and walked around once again, sitting and listening, talking to some people, and watching what to me is a magical snapshot of possibility. I tried to find the agenda for the general assembly meeting for that night, and couldn’t, so I didn’t stay. I talked with one of the media people, who was responsible for twitter and facebook presence. Her enthusiasm and deep optimism is what I am left with. We both celebrated how far from all white the camp was. Not quite fully representative of the population of Oakland, and at the same time much more so than is usually the case. Two weeks into the occupation, and under order of eviction that some believe is going to lead to a police raid sometime this week, services are solidifying and growing. The number of cities the world over who have their own Occupy movements is growing steadily. Yes, I wasn’t as satisfied with the process used at the general assembly meeting, and I am still mulling over how to integrate the responses to my post. It’s clear to me that I wasn’t fully walking my talk in what I wrote: I didn’t provide sufficient clarity of vision in what I wrote. I am mulling over, still, how to integrate the responses to that post. Until then, here’s where I am in this moment: despite the imperfections, I still have my sense of humility intact, and endless curiosity. My biggest hope is that we will never again see business as usual. However lengthy this post is, it’s still only part of what I wanted to write about. I’ve yet to address the discussions of the idea of “loving your enemies”, another rich conversation that took place while I was at OccupyOakland. I have also been reading and reflecting on the comments to my post about the GA process and I hope to write something useful in response about the GA process and governance more generally. And in the coming days I anticipate getting there again. Stay tuned for more. by Miki KashtanThe OccupyOakland I visited on October 15th was not a protest. You could say that I knew it, because I have read about it before I was there. I still couldn’t understand it fully until I saw what it meant. I suspect the same is true elsewhere, though I will not presume to know. A protest, in some fundamental way, engages with the existing power structures. What I saw, instead, was a parallel existence. This was not a march attempting to make something happen through demands and goals. What I saw was a gathering of people without any urgency, setting up camp, providing free services, engaged in the activities of making life happen, engaged in educating each other, curious to learn, and intent on inclusion. In an earlier post I was expressing some concern about the absence of a vision. What I saw in the park changed my perspective. I was fully humbled. There is absolutely no absence of vision. In fact, what was so compelling for me in being there was seeing a vision being lived out. They are not making demands. Instead, in their own small way, and however imperfectly, they are creating the world in which they want to live. There is free food being served 24/7, there are supplies of all kinds, energy created by people pedaling a bike, and everyone appears to be part of an incessant conversation. Can empathy serve as a reliable guide to action? David Brooks, in his recent article “The Limits of Empathy,” suggests that empathy is no guarantee that caring action will take place. Participants in Milgram’s famous 1950s experiments willingly inflicted what they thought were near-lethal electric shocks despite suffering tremendously. Nazi executors early in the war wept while killing Jews. And yet those strong feelings didn’t stop them. Why does this happen? I have been haunted for years by this great puzzle, reading, thinking, and writing about it. Brooks suggests that “People who actually perform pro-social action don’t only feel for those who are suffering, they feel compelled to act by a sense of duty. Their lives are structured by sacred codes.” My investigations lead me to think that “a sense of duty” is part of the problem, not the solution. A sense of duty usually gets instilled in us through fear and shame, leading us to act based on external considerations while doubting our own intuitive heart response. Who of us won’t remember times when despite being moved to do something caring we didn’t because of fear? Jason Marsh, in his response to Brooks, retells the story of Samuel and Pearl Oliner’s research findings about the empathic values on which rescuers - people who saved Jews during the Holocaust - were raised. The Oliners also point out that rescuers tended to be raised with little punishment. When there is no punishment, there is less shame and fear, and more willingness and capacity to honor our empathic inclinations. I carry with me, with some tenderness and horror, the story of a man I know who, at 7, delightedly told his science teacher that he had captured a special insect. His teacher asked him to put the insect in alcohol and bring it to school. The insect, meanwhile, had other designs. Struggling for its life, it repeatedly attempted to climb out of the alcohol, and succeeded in doing so several times before it was finally drowned. All this time the child was shaking as he struggled to overcome his aversion to inflicting further damage on the insect. In the name of contributing to science and obeying his teacher, he set his feelings aside. As an adult, he said: "I never questioned my actions, only my feelings." Being from Israel, I wanted to understand this dilemma in the context of the treatment of Palestinians by Israeli Jewish soldiers. Director Ido Sela, in his gripping 1993 documentary Testimonies (a short version of which is available on youtube), interviewed soldiers who shot Palestinians, subjected them to prolonged physical torture, or killed them during the first Intifada. They spoke of the same difficulty. Despite a felt sense of trauma from having inflicted harm on others they continued to do so. The most common reasons that allowed them to ignore, overcome, or numb out their empathic responses to the people they harmed were fear of consequences to them; doing what they were told to do; or believing it was the right thing to do. Only one person described an incident when he likened his own daughter to the children he was facing, and stopped short of harming them. Writer David Grossman, a Lt. Colonel in the US Army, studied extensively what makes people overcome the natural aversion to killing that was discovered after World War I. In On Killing, he demonstrates repeatedly that US Army training focused on reducing access to empathic response by numbing and desensitizing trainees, thereby increasing the shooting rate from 10-20% in earlier wars to 80 and 90% in later wars. The cost, he warns us, is unprecedented massive trauma to war veterans as well as to the nation that sent them to war. If we believe that humans are fundamentally evil and unruly, or at best plain old selfish, a view which still underlies most of the institutions we have in place, we will naturally want to control, shame, and punish our children into being “good” and insist on obedience to a strong code of behavior, thereby prolonging human suffering on this planet. As more and more of us trust our children and our own humanity, we will engage empathically enough with children and adults, allowing all of us to find and act on our own empathy without fear. I long to live to see that day. In a few days the Occupy Wall Street movement arrives in my town, Oakland, and I am thinking a lot about what I want to do. As I reflect on what’s been happening in the last number of weeks, I feel quite uplifted and so, so relieved. For months I was watching with growing discomfort the absence of action in the US while nonviolent resistance was spreading like wildfire to more and more countries. Now, finally, the movement is spreading in this country which I have made my home since 1983. City after city now has its own occupy location, with a similar spirit in many of them. I am quite sure I am not alone in holding tremendous curiosity to see how things will unfold, and some hope that perhaps some shift could result, even a fundamental systemic change. At the same time, I feel quite a bit of unease. Nonviolence, for me, is far from being simply the absence of overt physical violence. Nonviolence is a positive approach that requires tremendous courage. Nonviolence, if I listen carefully to Gandhi and Martin Luther King, Jr., rests on a deep love of all humans, including the ones the struggle and the resistance are mounted to topple. Nonviolence at its source emerges from clear vision, and is dramatically different from a purely oppositional movement. 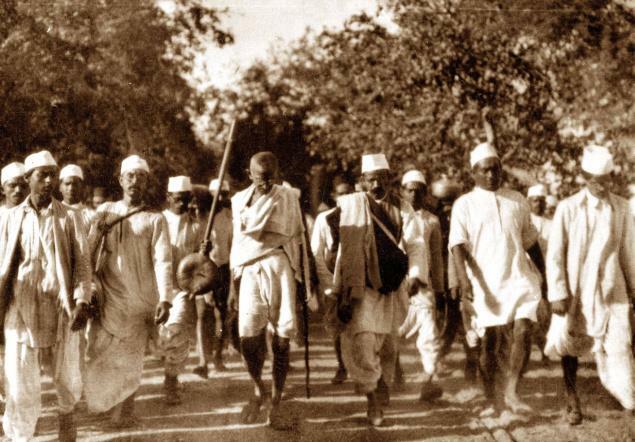 When Gandhi orchestrated the Salt March, he was at one and the same time violating the law as well as demonstrating with his actions the world he wanted to create. The same was true of the actions of young people during the Civil Rights Movement. A picket line outside segregated restaurants would have been pure protest. Boycotting the restaurants and blocking people from entering them would have been a disruption of business as usual. 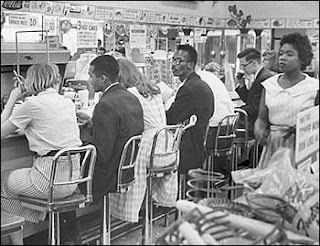 Actually sitting at the lunch counters, blacks and whites together, was what Sharif Abdullah calls “vision implementation.” Just like the Salt March, these actions were already part of the world being created, the transformation already taking place. In what I hear about the Occupy Wall Street movement I see a lot of creativity and sophistication in the form of organization, a willingness to keep learning and adapting, including in response to critiques from people of color, and quite a bit of tenacity and resilience. I can’t imagine a movement succeeding without these qualities. I repeat again: I am delighted that this mobilization is happening, and rooting for its success. At the same time, many of the statements I have seen contain “us/them” statements, and I know much more about what organizers and participants don’t want than about what they do want. Where is the loving vision that’s going to win over people? Where are the clear goals that can galvanize mass popular support for the movement? I have some wild hope that there can be a way for the many who gather and those who support them to articulate an inspiring vision. This is not about making demands. The people on the street as well as the organizers have been deliberately shying away from articulating demands (see Richard Eskow’ article on this point for an understanding of why this may be so). However, not having demands doesn’t mean not having a vision. If we don’t want corporate profit to rule the day, what is it that we want instead? I know what it is for me: A call to create structures and systems that put human needs at the center. What can it be for an entire movement that prides itself on self-organizing? How can a vision be articulated within such a movement? Which of us will go and attend the meetings to support that in happening? Mass popular support will also require finding a way to address the profound divides that continue to cut through US society. I see this possibility as resting on having conversations across many divides - political, racial, and social. The kinds of conversations that have rarely happened; that seek to transcend rather than entrench the polarities; that aim to find the shared human needs and dreams that give rise to such opposing views and experiences. Combining a simple and clear vision with the capacity to engage lovingly with others may be key to the movement’s ability to gain the consistent support of many more people. Creative Imagination and Nonviolence A third and last element that I would like to see is the capacity to mount multiple forms of actions beyond the current gatherings. With mass popular support and clear goals, what other steps could be taken that may increase the pressure and begin to undermine the sources of support of the existing institutions that the movement seeks to destabilize? Beyond pure protest, what actions could the movement generate that would demonstrate the vision? What would be the Salt March of this movement? I want to imagine for a moment what might happen if the vision indeed rests on honoring human needs. If so, what actions could a mass popular movement generate that both disrupt the control of corporations as well as provide for basic human needs? One of the key elements of Gandhi’s campaign is what he called Constructive Program. The centerpiece of his program was spinning, which both materially and symbolically freed Indians from relying on the British Empire for their clothing. A similar approach was taken by the Black Panthers who operated many parallel institutions to the state, a move designed to empower and free people. If freedom from the rule of corporations and basic human needs were the goal of the Occupy Wall Street movement, what could masses of people do that would directly attend to human needs? Before any specific action is contemplated, I want to emphasize that it’s critical that whatever the action, it has to be taken by a sufficiently large number of people so that they're less vulnerable to possible consequences and repression. What if masses of people took possession of goods produced by corporations and distributed them to those in need? What if large groups of people appropriated structures and buildings so that homeless people, including those created through the recent ongoing foreclosures, would have a place to live? What if a million people stopped paying taxes and invested that money in sustainable technologies or permaculture? Would such actions be the equivalent of the Salt March or the lunch counters? And what would be today’s equivalent of the spinning? Gandhi insisted that anyone who joined his movement would commit to spinning for 30 minutes a day. What if we all committed to 30 minutes a day of taking action, individually, in groups, and in communities, that would free us from the rule of large institutions in the areas of food, shelter, clothing, health, and education - the most basic of human needs? Can you imagine how much energy a movement could generate if every day masses of people engaged in popular education, grew and made food from scratch, learned again how to make home-based medicines, and supported each other in all these areas? I have more questions than answers, because I am only one person. I hope you join me - in responses to this post, in conversations with others, and in the general assemblies of the various occupations. Despite immense material benefit for some at the expense of others, I don’t believe that the current social order truly works for anyone. Let us march together towards the radically simple goal that Sharif Abdullah envisioned: a world that works for all. Not only did my parents have the legal right to take me against my will. That right is enshrined in millennia of social norm. Would I have wanted my parents not to go to Mexico because I didn’t want to go? Not exactly. I would have wanted them to be open to considering not going as a possible outcome once all the needs were on the table. More than anything, I would have wanted them to hear and appreciate the horrible loss I was about to incur, to hear my plight and hold my needs alongside theirs. I would have wanted them to let me know, in full, their needs, their struggles, and their perspective that would lead them to want to go. I would have wanted to be invited into joint holding of all the needs and making the decision together. The experience of having no choice and no say in our lives, endemic and pervasive in almost all children’s lives, many women’s lives, still, around the world, and other groups with little access to resources is acutely painful and traumatic. I wish it on no one, not even people who have done acts of horror against others, and certainly not so many of us on a daily basis. Janey: If you really didn’t want to go, and since I really do want to go, it might be hard to figure out what to do. Sam: (after some more conversation): Sure, I'll go. Janey: (some time later): What if I told you that you and your brother could make the decision about whether we go or not--whatever you say, we'll do. What would you say then? Children, like the rest of us human beings, want to be able to participate in decisions that affect them. Yes, we tell ourselves that they can’t, they don’t know enough, they can’t be trusted. The very same kinds of arguments that were used in the past to justify denying choice to women, or to blacks, or other groups. Although we are far from full participation of any such group, as I painfully know as a woman, the established norm is one of equal rights under the law. When it comes to children, however, there isn’t even a lip service commitment to equality. Children are still fully “owned” by their parents, and it’s acceptable and customary to restrict their movement, punish them at will, including physically, and make decisions that affect them dramatically without consulting with them first. The only group of humans still held in this way. This is an extremely tall order. How can any parent in our society, even if they wholeheartedly embrace the full participation of their children, find enough inner capacity to navigate it all and in addition learn how to do it in partnership with children? If we are to create a world in which children experience choice, we would need to restructure life in major ways so that the responsibility doesn’t fall only on the one or two parents to respond to the needs of their children. I think about this a lot, and anticipate coming back to write about this topic more. Except in contexts where parents can physically force younger ones to go somewhere, most of the daily experience of life revolves more around attempting to control children’s behavior. Often I hear parents talk about giving or not giving their children choice in certain matters. Just today, for example, at a training I did, I heard one woman talk about her struggle with her 15-year-old who, in her words, “has to be home by 4pm” and who hasn’t been home by 4pm on most days in the last month. This young man was clearly exercising choice every day: the simple choice of whether or not to do what his mother said he “had” to do. It is completely within his power to make the choice not to come home by 4pm, as he has demonstrated repeatedly. There is nothing anyone can do to take away or give choice to another. Even when physically forced, we still have inner choice in how we respond to a situation. Even when a parent tells a child to go to their room, the child is still choosing whether or not to do so. The power to “make” the child do anything does not exist except when the parent can exercise physical force of some kind. Do parents have power in relation to their children’s choices? Absolutely! They have the power to restrict their children’s access to resources, and in this way limit their options. They also have another power that is at the heart of why it appears that we can make children, or other people, do what we want: parents have the power to deliver consequences for their children’s actions, backed up by legal and societal norms for doing so. This is no small matter, and every child knows that. The question I am left with is not whether or not we give children choice. They have it. The question for me is what we can do to support them in making choices that will nourish their lives and their ability to be thoughtful, active, caring participants in life, now and for the rest of their living days. I doubt that having them make choices based on fear of punishment is going to give them the inner strength and clarity of purpose necessary for making wise choices. I have faith in human beings, and I fiercely believe that showing children care and interest in their needs, and presenting clearly what parents need, is a breeding ground of empathic and courageous human beings who can make choices based on their deepest understanding of their own and others’ needs.